If you’re familiar with Notices of Inspection (NOI) from Immigration and Customs Enforcement, more likely than not, you’re also familiar with their corresponding fine schedules. Don’t worry if this is new information to your ears; you’ve come to just the right place. The following fine schedule applies when an employer has been determined to knowingly hire or continue to employ individuals who are not eligible for United States employment. An agent or auditor will determine the Violation Percentage by dividing the number of knowing hire and continuing to employ violations by the number of employees for which a Form I-9 should have been prepared. Let’s say a company should have prepared 10,000 Forms I-9 and an auditor determines they have 1,500 knowingly hire and/or continue to employ violations. Their Violation Percentage is 15% (1,500/10,000). 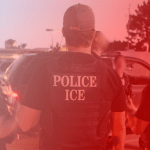 ICE will then review the number of times the company has broken that rule to assign a tier level. First-time violators pay the first tier amount and so on, up to three tiers. The fine amount can increase significantly depending on the assigned tier. Going back to our hypothetical company with a Violation Percentage of 15%. If this is their first-time offense, the company would pay a fine of $1,140, but if it is determined to be their third offense, the amount increases to a staggering $8,547. 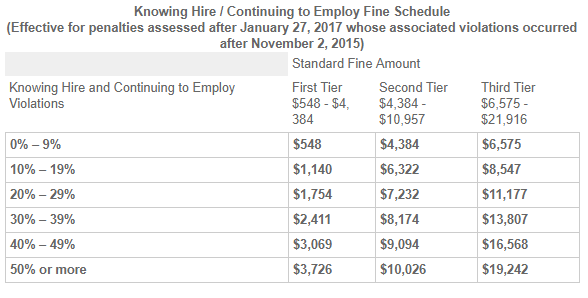 Please keep in mind, this standard fine amount applies to each knowing hire and continuing to employ violation. The standard amount listed in the table relates to each Form I-9 with violations.